For Nancy and Jim Watson, Ball State University became their home away from home. They attended college together at Elon University in North Carolina, moved to Appalachian State University, spent some time in Arkansas while Jim earned his doctorate, then ended up at Ball State together-together like they'd done everything since they got married. When the Watsons both found jobs at Ball State, it was like a dream come true. 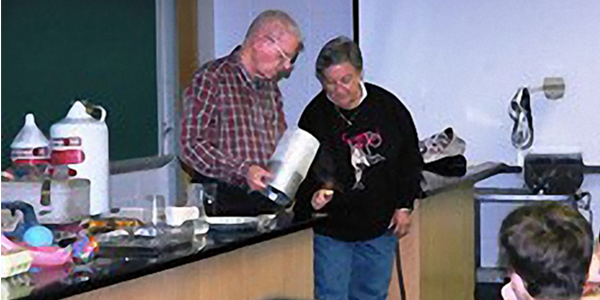 Jim worked with the physics department for 31 years while Nancy worked for the Burris Laboratory School teaching middle school science. The university was their welcoming community from the very beginning, and is still home for Nancy 41 years later. "There's a friendliness here. Faculty, staff, students...everyone is really friendly," said Nancy, admitting she was leery about moving to the Midwest after so many years in the South. "I loved being a faculty member and a faculty wife. I was part of the university, but I got to know all the faculty wives too. It really makes a home." After so many wonderful years at Ball State, both Nancy and Jim wanted to make sure the programs they were passionate about continued even after they were gone. Jim passed away in 2009, and following his death, Nancy established the James and Nancy Watson Planetarium Science Education Fund. This endowment is designed to continue the growth of the planetarium and physics department that Jim called home for so many years. And when Nancy retired in 2007, she began the Nancy and James Watson Burris Scholarship, which benefits low-income Burris Laboratory School students who continue their education as Ball State Cardinals. She also made a provision in her will to provide additional funding to her Burris scholarship and Planetarium science education funds at Ball State, as well as a scholarship fund she established at Elon University. The Watsons' love of teaching and helping students will continue for generations. "If you're going to make a planned gift, give while you're still capable of enjoying the fruits of that gift. Watch it materialize," said Nancy, who is a proud member of the foundation's Carillon, Fellows, and Beneficence societies. "I started making gifts early so I could watch the impact materialize in front of me, and now I've been able to make sure my gift will continue to impact the university the way I intended." And if you're considering a gift but don't know where to start, Nancy has some advice for that too. "I once asked a friend how I should begin the process of deciding where to leave my money, and his advice to me is perfect," she explained. "You want to put your money at the intersection of where your greatest impact meets your greatest passion."